Snoop the dog on three legs - Mooiness! And here’s the clip (1:35). Snoop the dog – an update from Marcus Ooi and Vimeo. This entry was posted in Photo blogging on Friday July 13, 2007 by mooiness. Good to see Snoop is doing well! Since you’re humouring requests, when’s your next “don’t call it a podcast”? omg, he is so energetic and tooo cute. Hope you don’t mind my saying, but he looks a little sad. Snoop has a very expressive face. man. the dog is just … fine ? This dog is more agile than most 4 legged dogs. Scarli next thing you know it, he will do a foward somersault via the missing leg. aww..the 1st pic looked sad. Thanks for putting Snoop’s pics. He looks kinda sad but so cute and cuddly. Lisa Y: haha yeah imagine when he had 4 legs – even faster! jl: yeah that’s his normal expression. It’s the eyebrows that adds to the sad look. Heheh. Forumer: har? I didn’t know what he wanted. herman: yup hardly any change whatsoever. Lupin: yeah yeah like those kung fu masters that flip forward right? blur ting: hahah yeah, like I said above that’s his normal expression. Oh, I just saw the video. couldn’t load it yesterday. Oh he is so cute and lively! Not sad looking at all! Thanks for the update. That is so cute. He looks so healthy and happy! blur ting: definitely not sad that’s for sure! 10/3: err, no comment about the socks. hahaha! shelly: yup, no change at all. Slightly slower maybe? Heh. erm…i think hor… it was cute up till the digits-chewing!!! coz a dog chased me when i was little. i had to ru n up a hill. i thought i was gonna die!!! bm: heheh. what you say is true – it’s one thing that obedience trainers would frown upon. But it’s something unique with Snoop because he’d just play snap and not really bite. Is he a jrt? I have a JRT too.. that looks abit like snoop.. but smaller in size. 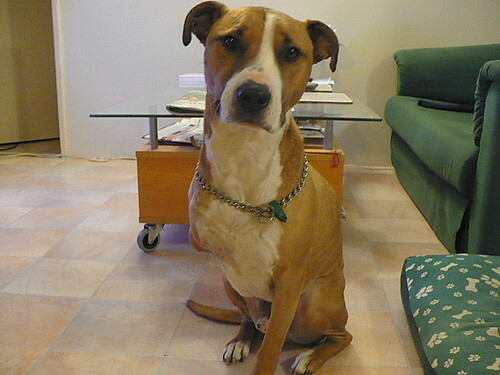 minty: he’s definitely an American Staffordshire Terrier (Google link) crossed with something else. We don’t know what that something else is because he was adopted from the dog pound. minty: yeah his facial expression is misleading. Heheh. Cherisher: as mentioned a few times here, that’s his usual expression and the video shows you the way he really is.